ITS Global | Consultants on Global Issues: [domain name: itsglobal.net]"ITS Global is a dynamic consultancy specialising in public policy in the Asia Pacific region. Its expertise include: trade, economics and investment; environment and sustainability; aid and development; and corporate social responsibility and risk. It enables clients to assess implications of policy; develop and implement strategies to manage policy impacts; and to improve policy formulation." United States to Host Trans-Pacific Partnership Trade Ministers’ Meeting in Atlanta | United States Trade Representative: "The United States will host a meeting of Trans-Pacific Partnership (TPP) Trade Ministers in Atlanta, GA from September 30th – October 1st preceded by a meeting of TPP Chief Negotiators from September 26th-29th. Trade Ministers and negotiators last met in July and have been making good progress toward resolving the limited number of outstanding issues." (1) Intellectual Property Chapter: Leaked draft texts of the agreement show that the IP chapter would have extensive negative ramifications for users’ freedom of speech, right to privacy and due process, and hinder peoples' abilities to innovate. The twelve nations currently negotiating the TPP are the US, Japan, Australia, Peru, Malaysia, Vietnam, New Zealand, Chile, Singapore, Canada, Mexico, and Brunei Darussalam. The TPP contains a chapter on intellectual property covering copyright, trademarks, and patents. Since the draft text of the agreement has never been officially released to the public, we know from leaked documents, such as the May 2014 draft of the TPP Intellectual Property Chapter [PDF], that US negotiators are pushing for the adoption of copyright measures far more restrictive than currently required by international treaties, including the controversial Anti-Counterfeiting Trade Agreement (ACTA). All signatory countries will be required to conform their domestic laws and policies to the provisions of the Agreement. In the US, this is likely to further entrench controversial aspects of US copyright law (such as the Digital Millennium Copyright Act[DMCA]) and restrict the ability of Congress to engage in domestic law reform to meet the evolving IP needs of American citizens and the innovative technology sector. The recently leaked US-proposed IP chapter also includes provisions that appear to go beyond current US law. Place Greater Liability on Internet Intermediaries: The TPP would force the adoption of the US DMCA Internet intermediaries copyright safe harbor regime in its entirety. For example, this would require Chile to rewrite its forward-looking 2010 copyright law that currently establishes a judicial notice-and-takedown regime, which provides greater protection to Internet users’ expression and privacy than the DMCA. Escalate Protections for Digital Locks: It will compel signatory nations to enact laws banning circumvention of digital locks (technological protection measures or TPMs)[PDF] that mirror the DMCA and treat violation of the TPM provisions as a separate offense even when no copyright infringement is involved. This would require countries like New Zealand to completely rewrite its innovative 2008 copyright law, as well as override Australia’s carefully-crafted 2007 TPM regime exclusions for region-coding on movies on DVDs, video games, and players, and for embedded software in devices that restrict access to goods and services for the device—a thoughtful effort by Australian policy makers to avoid the pitfalls experienced with the US digital locks provisions. In the US, business competitors have used the DMCA to try to block printer cartridge refill services, competing garage door openers, and to lock mobile phones to particular network providers. Expand Copyright Terms: Create copyright terms well beyond the internationally agreed period in the 1994 Agreement on Trade-Related Aspects of Intellectual Property Rights (TRIPS). The TPP could extend copyright term protections from life of the author + 50 years, to Life + 70 years for works created by individuals, and either 95 years after publication or 120 years after creation for corporate owned works (such as Mickey Mouse). Read more about the TPP Copyright Trap. Enact a "Three-Step Test" Language That Puts Restrictions on Fair Use: The U.S. Trade Representative (USTR) is putting fair use at risk with restrictive language in the TPP's IP chapter. US and Australia have proposed very restrictive text, while other countries such as Chile, New Zealand, and Malaysia, have proposed more flexible, user-friendly terms. Adopt Criminal Sanctions: Adopt criminal sanctions for copyright infringement that is done without a commercial motivation. Users could be jailed or hit with debilitating fines over file sharing, and may have their property or domains seized even without a formal complaint from the copyright holder...."
Minds+Machines 2015 - Day 1 - GE - September 29, 2015, San Francisco: CEO Jeff Immelt and a global community of industry experts at Minds + Machines, GE’s fourth annual #IndustrialInternet event. Above: Billionaire investor Carl Icahn's new video: "Danger Ahead" in which he warns of the results of interest rates that have been kept too low for too long, saying stocks could go down "a lot more" as the market comes to grips with bubbles exacerbated by the Fed's zero interest rate policy. Icahn told CNBC the US Federal Reserve "may have backed itself into a corner." Icahn argues the Fed should have hiked interest rates months ago, but doing so now is harder given China's weakness and other emerging markets. Corporate earnings are "suspect," driven by low interest rates more than anything else--"Instead of taking the money that they can borrow and really invest it in machinery, in their workers to make them more productive, what they do with the money is almost perverse. They just go in and buy another company to show analysts on Wall Street that earnings are going up, so their stock will go up and it's financial engineering at its height." Tax reform is needed on the issue of inversions and the repatriation of foreign profits. UPDATE: September 29, 2015: Glencore Feels the Pain from China-led Slowdown - Glencore Plc rebounded in London trading a day after the stock fell 29 percent to a record low on concern is debt pile its too large to withstand a prolonged slump in commodity prices. Glencore has been caught up in a China-led slowdown that’s hit prices for commodities from oil to copper to coal. Billionaire Chief Executive Officer Ivan Glasenberg is working on a $10 billion debt reduction plan that includes the sale of assets, shelving of the company’s dividend and a $2.5 billion share sale completed earlier this month. Glencore may spark a Lehman moment for miners (CNBC): "Hong Kong-listed shares of the Anglo–Swiss commodity giant crashed 27 percent on Tuesday after its London-listed shares plummeted 29 percent in the previous session amid fears about its financial health. A widely-circulated note from Investec [investec.com] on Monday pointed to a debt base well above peers and a lower-margin asset base, warning of a scenario in which earnings could collapse entirely as the firm works purely to repay debt. That would eliminate all shareholder value, the brokerage warned." SEC Filing: Form 8-K (July 17, 2015) "... Under the spin-off plan announced on January 27, 2015, Yahoo plans to distribute all of the outstanding shares of Aabaco Holdings pro rata to its shareholders. Immediately after the spin-off, Aabaco Holdings will own approximately 384 million shares of Alibaba Group, representing an ownership interest of approximately 15% in Alibaba Group, and a 100% ownership interest in a newly formed entity which will own Yahoo Small Business..."
"On September 8, 2015, Yahoo! Inc. (“Yahoo” or the “Company”) filed a Current Report on Form 8-K (the “September 8 Form 8-K”) disclosing, among other things, that the Internal Revenue Service (“IRS”) had notified Yahoo’s counsel that it had determined, in the exercise of its discretion and without ruling adversely, not to grant Yahoo’s request for a private letter ruling regarding certain aspects of its previously announced plan for a spin-off to Yahoo’s stockholders of all of the stock of Aabaco Holdings, Inc. (“Aabaco”), a newly formed independent registered investment company, which will hold all of Yahoo’s remaining holdings in Alibaba Group Holding Limited (“Alibaba”) and Aabaco Small Business, LLC (a newly formed entity which will own Yahoo Small Business). Yahoo further disclosed in the September 8 Form 8-K that work was proceeding on the Aabaco spin-off plan, and that Yahoo’s Board of Directors would continue to carefully consider the Company’s options, including proceeding with the spin-off transaction on the basis of an opinion of counsel. "On September 14, 2015, the IRS issued a formal “no-rule” policy with respect to certain transactions similar to the Aabaco spin-off and, in a notice released on the same day, indicated that the IRS and U.S. Department of the Treasury are studying the possibility of promulgating new guidance with respect to such transactions in the future. Neither this ongoing guidance project nor the IRS’s decision not to rule with respect to the Aabaco spin-off transaction changes the current law applicable to the proposed spin-off. In addition, on September 19, 2015, an IRS official indicated in a public statement that any future guidance issued as part of the project would not apply retroactively to transactions completed prior to the issuance of such guidance. "On September 23, 2015, Yahoo’s Board of Directors authorized the Company to continue to pursue the plan for the Aabaco spin-off transaction as previously disclosed, except that completion of the spin-off will not be conditioned upon receipt of a favorable ruling from the IRS. The spin-off transaction will continue to be subject to certain other conditions, including final approval by Yahoo’s Board of Directors, receipt of a legal opinion with respect to the tax-free treatment of the transaction under U.S. federal tax laws and regulations, the effectiveness of an applicable registration statement filed with the Securities and Exchange Commission (“SEC”) and compliance with the requirements under the Investment Company Act of 1940, and other customary conditions, each of which conditions may be waived, in whole or in part (to the extent permitted by law), by Yahoo in its sole discretion. "On September 28, 2015, Aabaco filed Amendment No.1 to its Registration Statement on Form N-2 which is available on the SEC’s website at www.sec.gov using the name Aabaco Holdings, Inc.
Aabaco Amendment No. 1, Form N-2 (September 28, 2015): "... Following the Spin-Off, the Fund will be an independent, publicly traded, non-diversified, closed-end management investment company registered under the Investment Company Act of 1940 (the “1940 Act”). 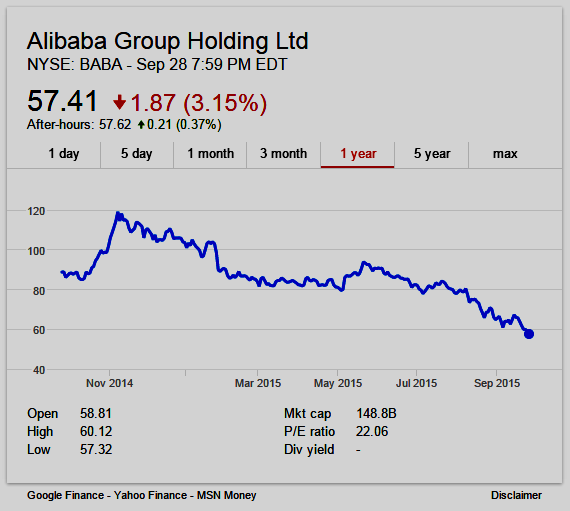 Immediately after the Spin-Off, the Fund’s investment assets will consist of 383,565,416 ordinary shares, par value US $0.000025 per share (the “Ordinary Shares”), of Alibaba Group Holding Limited (“Alibaba”), representing as of the date of this information statement an approximate 15 percent ownership interest in Alibaba, and a 100 percent ownership interest in Aabaco Small Business, LLC, which was formed by the Fund in connection with the Spin-Off and, prior to the Spin-Off, will acquire those assets and assume those liabilities that exclusively relate to the business that has historically been operated by Yahoo under the name “Yahoo Small Business.” We sometimes refer to Alibaba’s Ordinary Shares and Alibaba’s American Depositary Shares (the “Alibaba ADS”) collectively as the “Alibaba Shares.”..."
Sen. Cruz recently filed the DOTCOM Act as an amendment to the highway reauthorization bill the Senate considered in July. Cruz's amendment is identical to the original version of the DOTCOM Act being considered by the Senate with one exception: it would require Congress to have an affirmative up or down vote on the Obama Administration's plan to give away the Internet. On March 14, 2014, the National Telecommunications and Information Administration (“NTIA”) announced its intent to relinquish oversight of Internet domain name functions to the “global stakeholder community.” This proposed transition raises questions about NTIA’s authority to transfer possession and control of critical components of the Internet’s infrastructure to a third party. The Internet as we know it has evolved from a network infrastructure first created by Department of Defense researchers. One key component of that infrastructure is the root zone file, which the federal government currently designates as a “national IT asset.” Creation of the root zone file was funded by the American taxpayer and coordinated by the Department of Defense, and the file has remained under United States control ever since. Under Article IV, Section 3 of the Constitution, Congress has the exclusive power “to dispose of and make all needful rules and regulations respecting the territory or other property belonging to the United States.” One question arising from NTIA’s decision to transfer its Internet oversight functions to a third party is whether NTIA may relinquish possession and control of the root zone file—or any other similar component of the Internet that was financed and developed by the United States—without authorization from Congress. This concern was raised in 2000 by the Government Accountability Office (“GAO”), which questioned whether NTIA could relinquish authority over the root zone file and concluded that it was “unclear whether such a transition would involve a transfer of government property to a private entity.” The 2000 GAO report further detailed that the Department of Commerce advised the GAO at the time that “we have not devoted the possibly substantial staff resources that would be necessary to develop a legal opinion as to whether legislation would be necessary” to authorize transfer of the root zone file. Congress should be made aware of the legal status of the root zone file—or any other potential government property—before it makes any final decisions about whether to transfer the government’s Internet oversight functions to a third party. Given this history, we are concerned that NTIA might potentially relinquish ownership of some form of United States property. To inform the Congress so that it may take any necessary and appropriate steps regarding NTIA’s planned transition of the IANA functions, we would like the GAO to conduct a review to address a number of specific questions. 1. Would the termination of the NTIA’s contract with ICANN cause Government property, of any kind, to be transferred to ICANN? 2. Is the authoritative root zone file, or other related or similar materials or information, United States government property? 3. If so, does the NTIA have the authority to transfer the root zone file or, other related materials or information to a non-federal entity? Please include in this report a description and analysis of the relevant legal authorities and case law dealing with the transfer of United States Government property. We understand that to perform this work, GAO will need to conduct both significant audit work and complex legal analysis. Please contact Jonathan Nabavi (Chairman Grassley), Sean McLean (Senator Cruz), Vishal Amin (Chairman Goodlatte), and Veronica Wong (Congressman Issa) of our staffs if there are questions regarding this request. Internet Assigned Numbers Authority Functions Contract between U.S. Department of Commerce and Internet Corporation for Assigned Names and Numbers. Contract Number SA1301-12-CN-0035. October 1, 2012. See, Amendment 11 of the Cooperative Agreement NCR-9218742 between the U.S. Department of Commerce and Verisign, Inc. Also see, Internet Assigned Numbers Authority Functions Contract between U.S. Department of Commerce and Internet Corporation for Assigned Names and Numbers. Contract Number SA1301-12-CN-0035. October 1, 2012. 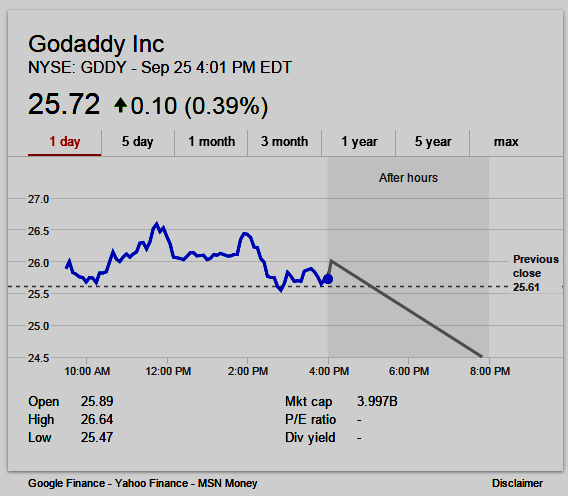 GoDaddy $GDDY Lockup Expiration September 28th, Will Shares Decline? GoDaddy [domain name: godaddy.com] NYSE: GDDY is the world's largest domain name registrar. 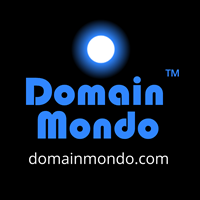 The company has over 13 million customers with over 60 million domains under management. September 28, 2015 ends the 180-day lockup period on GoDaddy Inc. Pre-IPO shareholders may sell their own shares totaling over 38 million, which are more than the 23 million shares initially offered. A potential increase in GDDY stock available could result in a dramatic decrease in the stock price. (source infra). IPO Lockup Expiration: GoDaddy - GoDaddy Inc. (NYSE:GDDY) | Seeking Alpha: "... 17 individulas and 4 firms, including KKR (Kohlberg Kravis Roberts & Co. L.P. ) hold restricted shares; if even some of these insiders decide to sell, an oversupply of shares available for public sale could send GDDY's share price tumbling down...."
GoDaddy went public (IPO) and started trading on the New York Stock Exchange on April 1, 2015--the stock opened and closed at $26.15 (31% above its higher-than-expected initial public offering price of $20 per share). The IPO valued the company at $5.48 billion although GoDaddy has not made a profit since 2009. CCWG Co-Chair THOMAS RICKERT: NEXT IN THE QUEUE IS FADI. FADI CHEHADE: YES. THANK YOU, LEON AND THANK YOU, THOMAS. THIS HAS BEEN AN INCREDIBLE TWO DAYS AND I STAYED BACK MOSTLY BUT I THINK IT'S TIME IF I COULD TO EXPRESS COMMENTS. FIRST, I WANT TO THANK YOU BECAUSE YOU HAVE BEEN REMARKABLE CHAIRS AND I ESPECIALLY TODAY THOMAS HOW YOU STARTED THE DAY FOR US. I APPRECIATE VERY, VERY MUCH. I DO BELIEVE THAT WE ARE CLOSE. BUT I DO BELIEVE WE ALSO HAVE SOME AREAS OF CONCERN. THIS MIDDLE COLUMN FOR EXAMPLE STARTED TWO DAYS AGO BY SAYING THAT WE HAVE MAJOR ISSUES IN THAT COLUMN. AND NOW IT SAYS IN PROCESS. I DON'T KNOW WHAT THAT MEANS. DOES IT MEAN SUDDENLY THAT THIS GROUP OF PEOPLE, WITHOUT THE FULL COMMUNITY HAS DECIDED TO MOVE FORWARD WITH THESE THINGS WHEN IN FACT 90+ COMMENTS DID NOT INDICATE WE HAVE CONSENSUS ON THESE ISSUES. I THEREFORE, ASK TO SHOW A SLIDE THAT I HAVE PREPARED WITH THE BOARD IN THE LAST FEW DAYS IN WHICH WE ATTEMPTED IN THE BEST WAY WE CAN TO SHOW WHERE ACTUALLY WE BELIEVE THERE IS CONSENSUS. AND THIS IS NOT A BELIEF BASED ON OUR VIEWS. THIS IS A BELIEF BASED ON READING ALL THESE COMMENTS MULTIPLE TIMES, LISTENING TO YOU, READING EVERYTHING YOU'VE DONE. AND I -- I BELIEVE THAT THIS SLIDE WILL HELP US MOVE FORWARD. SO, IF I HAVE YOUR PERMISSION, I'D LIKE TO SHOW THE SLIDE. THOMAS RICKERT: FADI, THANKS FOR THE OFFER. I GUESS THAT THIS IS WHAT THE GROUP THINKS IS THE CURRENT LEVEL OF SUPPORT. THE BOARD MAY HAVE ITS OWN VIEW ON THE ANALYSIS OF PUBLIC COMMENTS. BUT THAT'S ACTUALLY FOR THE WORKING GROUP TO DECIDE. SO I THINK WE SHOULD BE VERY CAUTIOUS NOT TO HAVE COMPETING VIEWS OR VERSIONS OR ASSESSMENTS OF CONSENSUS AND SHARE THEM. SO I RECOMMEND THAT YOU TAKE THE SLIDE AND SEND IT TO THE LIST FOR EVERYBODY'S REVIEW. FADI CHEHADE: I'M NOT ON THE LIST. THOMAS RICKERT: WE'VE WALKED THROUGH ALL THESE -- THE AREAS OF IMPROVEMENT. WE'VE ASKED THE GROUP TO CHIME IN. CHERINE DID SO. BUT I WOULD CAUTION US FROM, YOU KNOW, PRESENTING TO THE OUTSIDE COMMUNITY THE IMPRESSION THAT WE'RE NOW DISCUSSING THE BOARD'S DETERMINATION OF CONSENSUS, WHICH IS OBVIOUSLY A TASK FOR THE COCHAIRS. FADI CHEHADE: CAN I RESPOND, IF I COULD. THIS IS NOT THE BOARD'S VIEW. I'M PRESENTING TO YOU THE VIEW BASED ON THE STAFF'S INCREDIBLE WORK TO UNDERSTAND YOUR COMMUNITY'S AND MY COMMUNITY'S COMMENTS. AND I BELIEVE THAT IT IS IMPORTANT EVERYONE HEARS THAT AS WELL. SO SIMPLY SAYING THAT WE SUDDENLY MOVE THE MODEL BACK TO IN PROCESS WHEN FRANKLY, I DON'T KNOW WHAT THAT MEANS, MOST OF US DON'T UNDERSTAND WHAT THAT MEANS. IS -- I'M FRANKLY WITH ALL DUE RESPECT, I'M NOT GOING TO BE STEAMROLLED INTO THIS. I THINK WE HAVE TO STOP AND UNDERSTAND EXACTLY WHERE THE COMMUNITY, NOT THE PEOPLE WHO CAME TO LA HAVE CONSENSUS BASED ON THE TREMENDOUS AMOUNT OF COMMENTS TO RECEIVE. FADI CHEHADE: SO I'M SPEAKING AS AN INDIVIDUAL, HOW'S THAT. THOMAS RICKERT: WE HAVE MADE VERY CLEAR IN OUR PROCESS IS THAT THE GROUP AND IN PARTICULAR SUB TEAMS WILL DO THE ANALYSIS OF PUBLIC COMMENTS AND WE SHOULD AWAIT THAT. WE HAVE THIS ASSESSMENT ON THE TABLE WHICH HAS BEEN CRAFTED WITH THE ASSISTANCE OF THE GROUP. I DON'T SEE ANY BENEFIT IN HEARING THE BOARD'S ASSESSMENT OF THE CONSENSUS LEVEL. FADI CHEHADE: BASED ON ALL THE COMMUNITIES OUR COMMUNITY HAVE FILED WHICH WE HAVE SPENT TWO DAYS AND NOT ANALYZED. THOMAS RICKERT: THAT'S FOR THE WORKING GROUP TO BE DONE. FADI CHEHADE: AND CAN WE SHARE THEM WITH THE LIST? THOMAS RICKERT: YOU CAN SHARE THEM WITH THE LIST. BY ALL MEANS, PLEASE DO. WE HAVE A COMBU FORM. I WOULD NOT WANT TO SPEND TOO MUCH TIME ON THIS. (emphasis added) (Note: transcription unedited and not final--reviewed/corrected transcript will be posted on the CCWG Wiki). Rubens Kuhl: Fadi said the slide was ready for a few days, so it could have been submitted to the co-chairs. Robin Gross [GNSO - NCSG]: this is a CCWG mtg. Avri Doria: is this becoming hostile? words like steam rolled? And later, KAVOUSS ARASTEH commented in the meeting: "... SOME PEOPLE WERE EMOTIONAL TODAY. WE SHOULD RESPECT THE COLLEAGUES WITH FULL RESPECT. WE SHOULD NOT ATTACK THE PEOPLE. WE SHOULD ALLOW THE PEOPLE TO OPENLY, CLEARLY EXPRESS THEIR VIEWS. I KNOW THOMAS MAY BE VERY TIRED TODAY. ALL OF US ARE TIRED. AND WE SHOULD BE MAINTAIN AN ATMOSPHERE OF FRIENDSHIP AND MUTUAL RESPECT TO EACH OTHER. THIS IS NOT ACCEPTABLE. IN PARTICULAR WITH RESPECT TO HIS REACTION WITH FADI CHEHADE IS NOT ACCEPTABLE TO ME ..."
Keith Drazek: "I don't think anyone wants to get to a point of brinksmanship between community and Board. We're not there now and we should try to avoid it. That probably means the CCWG needs to assess all the public comments, including the Board's, and try to identify a compromise solution that doesn't compromise our stated goals. Some legitimate concerns have been raised by the Board and others, and we need to address them. Doing so should result in a compromise everyone can live with....consensus." On Saturday, September 26, 2015, the second day of the CCWG-Accountability F2F LA meeting, ICANN Board Chairman Steve Crocker informed the CCWG that the proposed single member model a/k/a CMSM model is not supported by the ICANN Board of Directors. Accordingly, CCWG's 2nd draft proposal for ICANN membership may likely fail to achieve the necessary "consensus"-- see "chat" comment of Keith Drazek, Chair of the ICANN Registries Stakeholder Group, above. STEVE CROCKER [ICANN Board Chairman]: THANK YOU VERY MUCH. WE CAN'T EMPHASIZE STRONGLY ENOUGH HOW THANKFUL WE ARE, HOW APPRECIATIVE WE ARE THAT EVERYBODY HAS COME TOGETHER. THIS IS A HASTILY SCHEDULED MEETING, DISPLACED A LOT OF SCHEDULES AND EVERYTHING. AND WE KNOW THAT A LOT OF -- THERE'S A LOT OF ENERGY THAT'S GONE INTO THIS. AND I WANT TO SPEAK -- I WANT TO SPEAK ABOUT THE BOARD'S POSITION AND ATTITUDE ABOUT ALL THIS. THE TRANSITION IS VERY IMPORTANT. "VERY IMPORTANT" IS NOT THE SAME AS IT DOMINATES EVERY POSSIBLE ALTERNATIVE. OUR PRIMARY COMMITMENT, OUR OVERRIDING COMMITMENT IS TO THE INCLUSIVE MULTISTAKEHOLDER MODEL. IT CANNOT SUPPORT COMPROMISES THAT UNDERMINE THAT MULTISTAKEHOLDER MODEL. THIS HAS BEEN BUILT UP IN A -- BY ACCRETION IN A WAY OVER 17 YEARS WITH CHANGES AND ADDITIONS AND MODIFICATIONS OVER TIME. EACH OF US SERVES ON THE BOARD FOR THREE-YEAR TERMS. AND EVEN IF WE EXTEND IT OUT AS I HAVE FOR A LONG TIME, EVENTUALLY IT COMES TO AN END. NONE OF US ARE HERE PERMANENTLY. THERE'S NO SENSE IN WHICH THE BOARD HAS A ROLE DISTINCT FROM THE COMMUNITY. WE COME FROM THE COMMUNITY. WE RETURN TO THE COMMUNITY. AND WE LEAVE BEHIND WHAT WE HOPE IS A STRONGER AND MORE VIBRANT OPERATION. BUT I WANT TO EMPHASIZE THAT AS STRONGLY AS WE ARE SUPPORTIVE AND BELIEVE THAT THE TRANSITION AWAY FROM THE CONTRACTUAL ARRANGEMENT WITH THE U.S. GOVERNMENT IS IN THE BEST INTEREST OF THE ENTIRE WORLD, THE ENTIRE COMMUNITY, NOT JUST THE CORPORATE STRUCTURE OF ICANN, IT IS SOMETHING THAT HAS PERSISTED FOR A LONG TIME. WE WRESTLE WITH IT. WE CHAFE UNDER IT A BIT. BUT IT HAS NOT BEEN DISASTROUS. SO THAT SETS A KIND OF THRESHOLD FOR WHAT OUR ULTIMATE DECISION PROCESS IS GOING TO BE. ANOTHER KEY THING THAT'S VERY VIBRANT AND VISIBLE TO US IS THE UNDERLYING ASSUMPTION, THE PREDICATE FOR THE ANNOUNCEMENT MADE A YEAR AND A HALF AGO WAS THAT THE U.S. GOVERNMENT WAS SAYING ICANN IS READY FOR BEING CAST LOOSE. IT DID NOT SAY WE ARE TIRED OF RUNNING IT AND WE HAVE TO FIND SOMEBODY TO SUBSTITUTE FOR OURSELVES. THEY DID SAY, OF COURSE, THEY WANTED A GLOBAL ENVIRONMENT, THE MULTISTAKEHOLDER MODEL TO BE COMFORTABLE, TO EVERYBODY TO BE COMFORTABLE WITH THE SYSTEM. AND IT OPENED UP THE DIALOGUE WHICH LED TO WHERE WE ARE TODAY. BUT THEY DID NOT -- AND I SHOULDN'T SPEAK ABOUT WHAT THEY SAID. BUT WE CERTAINLY DID NOT UNDERSTAND AND DON'T BELIEVE THAT CREATING A SUPERSTRUCTURE TO REPLACE THEM IN A CORPORATE SENSE WAS INTENDED, DESIRED, NEEDED, OR APPROPRIATE. SO WE'RE FEELING OUR WAY VERY GINGERLY THROUGH THIS PROCESS. THE BOARD BELIEVES VERY DEEPLY AND TRIES TO ACT APPROPRIATELY THAT WE REPRESENT AND CARRY OUT THE SENSE OF THE COMMUNITY. WE'RE NOT IN A BASTION POSITION OF DEFENDING OURSELVES AGAINST THE COMMUNITY BECAUSE IN THE END, WE ARE TRYING TO BE REPRESENTATIVES AND CARETAKERS ON BEHALF OF THE COMMUNITY. BUT AT THE END OF THE DAY, WE HAVE VERY STRONG RESPONSIBILITY. AND THAT RESPONSIBILITY IS CAREFULLY SEPARATED FROM EACH OF THE STAKEHOLDERS AND CONSTITUENCIES. WE TAKE CONFLICTS OF INTEREST VERY SERIOUSLY IN THE SEVERAL INSTANCES WHERE A PARTICULAR BOARD MEMBER HAS A BUSINESS RELATIONSHIP OR DOESN'T HAPPEN, BUT A PERSONAL RELATIONSHIP, IT HAS TO BE DISCLOSED AND THEY GET REMOVED FROM THE DECISION PROCESS AND SO FORTH. WE DON'T HAVE THE SAME FRAMEWORK OF PROTECTION AND DEVELOPMENT OF DISCIPLINE IF CONFLICTS OF INTEREST, FOR EXAMPLE, IN THE REST OF THE COMMUNITY. AND THAT'S FINE. THAT'S PERFECTLY FINE. BUT IT IS SOMETHING THAT WE TAKE SERIOUSLY. SO THE COMMENTS THAT WE SUBMITTED SOME TIME AGO, WE DID REPRESENT A BOARD POSITION. WE DID A QUICK CHECK THIS MORNING, AND 100% AGREEMENT THAT WHAT WE SAID THEN STILL STANDS. WE REALLY, REALLY DO BELIEVE THAT THIS IS SO CLOSE THAT IT'S THERE. AND, AS I SAID, WE ARE VERY STRONGLY SUPPORTIVE OF THE PRINCIPLES AND THE OBJECTIVES. AND WE'RE DOWN TO WHAT IS SOMETIMES SAID WITH A LITTLE BIT OF IRONY, THESE ARE JUST IMPLEMENT DETAILS BUT THE IMPLEMENT DETAILS ARE, IN FACT, QUITE IMPORTANT. I WAS REFLECTING AS I SAT IN MEETINGS -- IT IS ALMOST EMBARRASSING -- ALMOST 50 YEARS AGO TO BRING INDIVIDUALS TOGETHER TO BUILD THE ARPANET I WAS TERRIBLY CHAGRINED FAIRLY EARLY ON IN THE PROCESS WE HAD -- FIRST TIME WE HAD PEOPLE FLYING ALL THE WAY ACROSS THE U.S. TO COME TO A MEETING. AND THE MEETING FELL APART BY NOONTIME BECAUSE THE SOLUTION THAT I HAD BEEN PUSHING WAS REJECTED BY THE VERY PEOPLE I THOUGHT THAT I WAS DRAWING IT FROM. I WAS TAKING MODELS ABOUT THE WAY THE ADVANCED SYSTEMS AT MIT WORKED AND THE MIT PEOPLE CAME AND SAID "WE CAN'T DO THIS" MUCH THE WHOLE MEETING WAS IN SHAMBLES. I WAS A LOT YOUNGER THEN AND IT RATTLED ME. SOMEBODY TOOK ME ASIDE AND SAID "YOU WILL GET THROUGH THIS." SURE ENOUGH, THE PROTOCOLS GOT REBUILT, AND THE ARPANET GOT BUILT AND LOTS OF THINGS HAVE HAPPENED SINCE THEN. WE CAN MAKE THIS WORK, AND WE CAN MAKE THIS WORK WELL ENOUGH. I WAS VERY, VERY PLEASED TO SEE THE DIFFERENT SCENARIOS THAT WERE BEING DISCUSSED BEFORE LUNCH. TO MY EYE, THEY WERE MORE SIMILAR THAN DIFFERENT, DIFFERED IN SOME DETAILS. AND ONE OF THE TEST QUESTIONS I ASKED: WHAT WOULD HAVE BEEN DONE DIFFERENTLY? AND THERE WERE ANSWERS. IT WASN'T ZERO. AND I THINK THAT'S FINE. I THINK THERE WERE SOME THINGS THAT ONE COULD ARGUE IT WOULD HAVE BEEN BETTER IF IT WAS DONE DIFFERENTLY, AND THAT'S FINE. BUT I THINK WE WANT TO DO IT IN A MEASURED AND INCREMENTAL WAY AND WITH THE COMPLETE UNDERSTANDING THAT THIS IS AN ONGOING PROCESS. WE'VE HAD THE ATRT REVIEWS. WE'VE HAD THE STRUCTURAL REVIEWS. WE'D HAD PLENTY -- WE HAVE ALL OF THE ADVICE THAT COMES IN FROM THE ADVISORY COMMITTEES AND WE HAVE THE POLICIES THAT COME UP FROM THE SOs. THIS IS AN ONGOING PROCESS THAT WILL GO ON TOMORROW AND THE NEXT DAY AND THE NEXT DAY. AND IT IS NOT ESSENTIAL THAT WE GRAB HOLD OF EVERY SORT OF THING AND MAKE IT ALL HAPPEN NOW. SO I WANTED TO CONVEY THAT. I WANTED TO CONVEY THAT THE BOARD IS DEEPLY INVESTED IN TRYING TO BE HELPFUL, IF WE CAN, STAYING OUT OF THE WAY IF THAT'S THE BEST THING TO DO. BUT WE'RE NOT TO BORROW A PHRASE FROM SOME YEARS AGO, WE ARE NOT POTTED PLANTS. WE ARE NOT JUST SITTING HERE PASSIVELY. WE ARE VERY HEAVILY ENGAGED. AND WE HAVE QUITE HEAVY RESPONSIBILITIES. AND THOSE WILL GET EXPRESSED AS THEY ARE -- AS I'M TRYING TO DO NOW AND THEY HAVE BEEN IN THE PAST, AND THEY WILL CONTINUE AS WE GO. Re: CCWG-Accountability 2nd Draft Report: 2nd Draft Report [PDF, 2.62 MB]. The 2nd Draft Report is also available section by section on the CCWG-Accountability's Wiki workspace at https://community.icann.org/x/pKs0Aw. 08:30 - 08:45 – Welcome: Opening remarks and housekeeping; Define meeting goals, outcomes. [CCWG-ACCT] On behalf of CoChairs - September Face-to-Face Meeting: ".. we will be holding a CCWG meeting on Sept 25-26... We plan to have comms and graphical experts from Xplane on site. We confirm LA as the location in order to make it easier for interested Board members to join the meeting. ..."
Roelof Botha: Tech Valuations Not Near 1999 Levels - Roelof Botha, a Sequoia Capital partner, discusses the macro environment and startup investing with Bloomberg's Emily Chang on "Bloomberg West" on September 24, 2015. UPDATE September 24, 2015: CCWG-Accountability "On the Way to LA" to hijack the Global DNS from the Global Multistakeholder Community through their deceptively named CMSM or "Community Mechanism as Sole Member" Model which allows select groups of ICANN "stakeholders" to override ICANN Board decisions and disregard the ICANN Board's fiduciary duties to the global multistakeholder community including the Board's fiduciary duty to act in the global public interest at all times. I detail below my concerns. Does this imply that individuals and civil society organizations are not stakeholders? Does this imply that comments from individuals and civil society organizations were not considered? Slides 8 ff. of the PDF present breakdowns of responses. For example, it is stated that 27 responses agreed that the CCWG-Accountability proposal enhances ICANN's accountability while 61 did not provide an answer. It may be correct that 61comments did not explicitly answer that question, but at least six responses did answer it negatively, albeit implicitly ... The statistics presented are misleading because they imply that "did not provide answer" implies support for the proposal, which is not necessarily the case ..."
Domain Mondo has previously noted the CCWG-Accountability publishing misleading representations of the public comments received to the 2nd Draft Report. The CCWG-Accountability is scheduled to meet with members of the ICANN Board this Friday and Saturday. Maybe the ICANN Board of Directors can at least do something about the CCWG leadership publishing "misleading statistics." The CCWG-Accountability is looking more and more like an "insider deal" favoring the vested self-interested special interests ("ICANN stakeholders" or "lobbyists") who have always wanted to totally control and financially benefit from ICANN policy-making, to the exclusion of "outsiders" (a/k/a global multistakeholder community or "global Internet community") and to the detriment of the "global public interest." With US (NTIA) stewardship in place, the lobbyists could never totally control ICANN--now is their chance. Have you registered, or are you thinking about registering, one or more domain names? Then you need to have on file (digital and hard copy) the information on file with ICANN as to the legal name, telephone number and email address of your domain name registrar. It may also be a good idea to know the physical or "operational" address of your registrar. If you discover your domain name registrar is not listed at the ICANN link above, Domain Mondo recommends you do not do business with that "Registrar" and quickly make arrangements to transfer all of your domain names to the ICANN-Accredited Registrar of your choice (e.g., Namecheap, Hover (Tucows), GoDaddy, etc. ), there are many "reputable" and "accredited" domain name registrars--preference is a matter of personal needs and choice, with some of the factors being price, reliability, support, ease of use, etc., as well as other factors, some of which are discussed below. a) ICANN: Domain Name Registrants' Rights:: "... You [domain name registrant] shall not be subject to false advertising or deceptive practices by your Registrar or though any proxy or privacy services made available by your Registrar. This includes deceptive notices, hidden fees, and any practices that are illegal under the consumer protection law of your residence ..." If your registrar is not subject to the jurisdiction in which you live, it could be a problem. b) Rules for Uniform Domain Name Dispute Resolution Policy (UDRP - the "Rules"): "... Mutual Jurisdiction means a court jurisdiction at the location of either (a) the principal office of the Registrar (provided the domain-name holder has submitted in its Registration Agreement to that jurisdiction for court adjudication of disputes concerning or arising from the use of the domain name) or (b) the domain-name holder's address as shown for the registration of the domain name in Registrar's Whois database at the time the complaint is submitted to the Provider..."
c) Uniform Rapid Suspension System or URS - (applicable only to new gTLDs and those legacy gTLDs that have subsequently adopted* it--but does not include .COM domain names): "... Mutual Jurisdiction: means a court jurisdiction at the location of either (a) the principal office of the Registrar or (b) the domain-name holder's address as shown for the registration of the domain name in Registrar's Whois database at the time the complaint is submitted to the Provider..."
Final note: some ICANN-accredited Registrars are also Resellers for other Domain Name Registrars--for example, Namecheap, an ICANN-accredited Registrar, is also a Reseller for Enom, also an ICANN-accredited Registrar. If you have registered a .COM domain name through Namecheap, your registrar agreement may be with Enom, therefore keep on file the information for both Namecheap and Enom.